Stephen King: The 'Craft' Of Writing Horror Stories While writer Stephen King was recovering from a near-fatal car accident, he finished a nonfiction book about the craft of writing. In a 2000 interview with Terry Gross, King talked about the demons that haunted him after the accident — and how writing helped his recovery process. 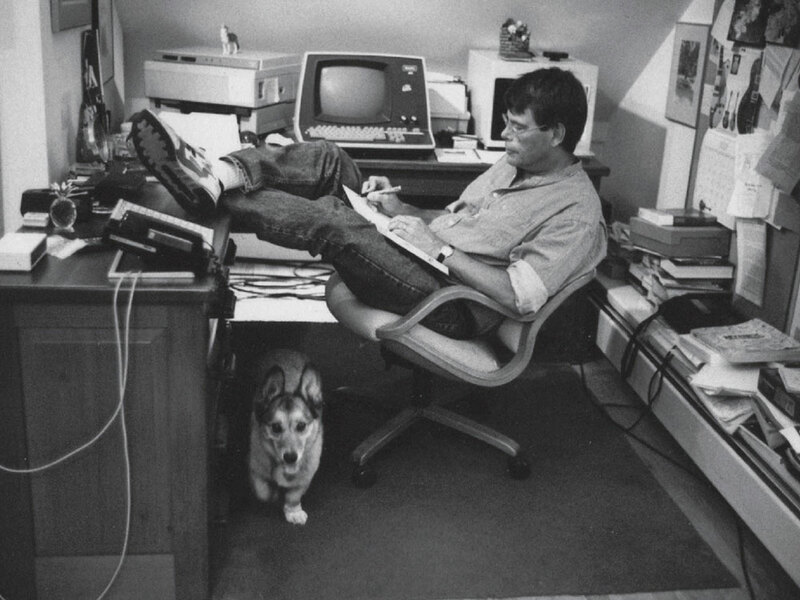 Stephen King working at his home office in Maine in the 1980s. In the summer of 1999, writer Stephen King was nearly killed while taking his daily walk. A driver had left the highway and struck King as he strode along the gravel shoulder of Route 5 in Maine. 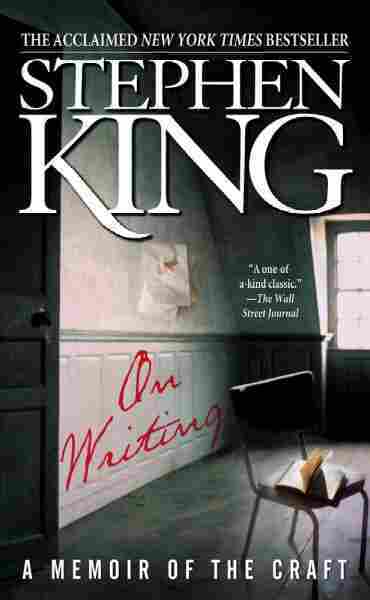 While recovering from his injuries, King worked on a book called On Writing. The book was both a reflection on his craft and his thoughts about the accident that required months of rehabilitation to repair his broken bones. In a 2000 interview on Fresh Air, King described his life-changing accident to Terry Gross but said it didn't change the way he approached his writing. "Obviously, it has given me some new things to write about and some new experiences to put in stories, and I've already begun that procedure," he explained. "Given a choice, if somebody had walked up to me and said, 'Well, Steve, you can continue to live the same old, boring, healthy life and you won't have any real, new experiences and you can retire at 55, or you can go for the car accident: You can get hit by the van and put in the hospital, and you'll get some new experiences and you can write until you're 60. Which do you choose?' And immediately I would say, 'Give me the boring life. I'll stop at 55.' So I do have some new experiences, and I probably will write some other things and go on for a while." More than 350 million copies of King's novels and short story collections are in print. He received the 2003 National Book Foundation Medal for Distinguished Contribution to American Letters. His most recent titles include Dreamcatcher, Under the Dome, Just After Sunset and Bag of Bones. The 10th-anniversary edition of his book On Writing: A Memoir of the Craft will be released on July 6. "It all seemed familiar to me in the sense that there was nothing involved with the whole deal that I didn't expect, but the odd thing is that when you've been seriously hurt, there's a kind of numbing shock that sets in, and as a result, everything is -- there's no surprise involved with any of the things that seem to go on. You just sort of -- the things come and you deal with them. It's like being cast adrift and riding the waves." "You know, they'd all read Misery, and they worked for an outfit called the Bangor Area Visiting Nurses. These are nurses who go into the home and give home care. And I think one of them told me toward the end of the period, where I needed full-time nursing, that they had all read it, and they had all been called into the office by their superior and told in no uncertain terms, 'You don't make any Misery jokes.' "
"If I thought anything was unfair about what had happened to me, it was that after struggling and winning a battle to get off all sorts and drugs and alcohol [before the accident] -- [not only did I] have a problem with beer and cocaine; I was an addictive personality, period. I was smoking two packs of cigarettes a day. I loved Listerine. I loved NyQuil. You name it. Boy, if it would change your consciousness, I was all for that. And I was able to jettison almost all of those substances out of my life. "And suddenly, you wake up in a hospital bed and you've got a phenyltol patch on your arm and you're jacked up on morphine and you've got all these different medications. I was as grossed out by that, I think, as I was by the injuries, thinking, 'My God, I'm a junkie again.' And the way that I deal with it, rightly or wrongly, is to try and make sure that you never exceed the dosage that you're supposed to have for things like Percocet or Vicodin ... and as long as you stay below the prescribed levels and as long as you're making a reasonable effort to get clean, that's a good thing to do. ... On the other hand, as other people say in those programs that I attend, 'I didn't get sober to suffer.' And if I'm in a situation where I'm miserable and medication will help that suffering, I'm going to take it." "I've always believed in God. I also think that's the sort of thing that either comes as part of the equipment, the capacity to believe, or at some point in your life, when you're in a position where you actually need help from a power greater than yourself, you simply make an agreement. 'I will believe in God because it will make my life easier and richer to believe than not to believe.' So I choose to believe. ... I can also say, 'God, why did this have to happen to me when if I get another step back, you know, the guy misses me entirely?' Then God says to me, in the voice that I hear in my head ... basically tells me to 'Get lost, I'm polishing my bowling trophies.' "
"I was in the hospital, mostly unconscious; my wife got a lawyer who's just a friend of the family. My son and his son went to school together, so we know him really well. And she got in touch with him and said, 'Buy it so that somebody else doesn't buy it and decide to break it up and sell it on eBay, on the Internet.' And so he did. And for about six months, I did have these, sort of, fantasies ... of smashing the van up. But my wife -- I don't always listen to her the first time. But sooner or later, she usually gets through. And what she says makes more sense than what I had planned. And her thought was that the best thing to do would be to very quietly remove it from this plane of existence, which is what we did." If you want to be a writer, you must do two things above all others: read a lot and write a lot. There's no way around these two things that I'm aware of, no shortcut. I'm a slow reader, but I usually get through seventy or eighty books a year, mostly fiction. I don't read in order to study the craft; I read because I like to read. It's what I do at night, kicked back in my blue chair. Similarly, I don't read fiction to study the art of fiction, but simply because I like stories. Yet there is a learning process going on. Every book you pick up has its own lesson or lessons, and quite often the bad books have more to teach than the good ones. When I was in the eighth grade, I happened upon a paperback novel by Murray Leinster, a science fiction pulp writer who did most of his work during the forties and fifties, when magazines like Amazing Stories paid a penny a word. I had read other books by Mr. Leinster, enough to know that the quality of his writing was uneven. This particular tale, which was about mining in the asteroid belt, was one of his less successful efforts. Only that's too kind. It was terrible, actually, a story populated by paper-thin characters and driven by outlandish plot developments. Worst of all (or so it seemed to me at the time), Leinster had fallen in love with the word zestful. Characters watched the approach of ore-bearing asteroids with zestful smiles. Characters sat down to supper aboard their mining ship with zestful anticipation. Near the end of the book, the hero swept the large-breasted, blonde heroine into a zestful embrace. For me, it was the literary equivalent of a smallpox vaccination: I have never, so far as I know, used the word zestful in a novel or a story. God willing, I never will. Asteroid Miners (which wasn't the title, but that's close enough) was an important book in my life as a reader. Almost everyone can remember losing his or her virginity, and most writers can remember the first book he/she put down thinking: I can do better than this. Hell, I am doing better than this! What could be more encouraging to the struggling writer than to realize his/her work is unquestionably better than that of someone who actually got paid for his/her stuff? One learns most clearly what not to do by reading bad prose -- one novel like Asteroid Miners (or Valley of the Dolls, Flowers in the Attic, and The Bridges of Madison County, to name just a few) is worth a semester at a good writing school, even with the superstar guest lecturers thrown in. Good writing, on the other hand, teaches the learning writer about style, graceful narration, plot development, the creation of believable characters, and truth-telling. A novel like The Grapes of Wrath may fill a new writer with feelings of despair and good old-fashioned jealousy -- "I'll never be able to write anything that good, not if I live to be a thousand" -- but such feelings can also serve as a spur, goading the writer to work harder and aim higher. Being swept away by a combination of great story and great writing -- of being flattened, in fact -- is part of every writer's necessary formation. You cannot hope to sweep someone else away by the force of your writing until it has been done to you. So we read to experience the mediocre and the outright rotten; such experience helps us to recognize those things when they begin to creep into our own work, and to steer clear of them. We also read in order to measure ourselves against the good and the great, to get a sense of all that can be done. And we read in order to experience different styles. You may find yourself adopting a style you find particularly exciting, and there's nothing wrong with that. When I read Ray Bradbury as a kid, I wrote like Ray Bradbury -- everything green and wondrous and seen through a lens smeared with the grease of nostalgia. When I read James M. Cain, everything I wrote came out clipped and stripped and hardboiled. When I read Lovecraft, my prose became luxurious and Byzantine. I wrote stories in my teenage years where all these styles merged, creating a kind of hilarious stew. This sort of stylistic blending is a necessary part of developing one's own style, but it doesn't occur in a vacuum. You have to read widely, constantly refining (and redefining) your own work as you do so. It's hard for me to believe that people who read very little (or not at all in some cases) should presume to write and expect people to like what they have written, but I know it's true. If I had a nickel for every person who ever told me he/she wanted to become a writer but "didn't have time to read," I could buy myself a pretty good steak dinner. Can I be blunt on this subject? If you don't have time to read, you don't have the time (or the tools) to write. Simple as that. Reading is the creative center of a writer's life. I take a book with me everywhere I go, and find there are all sorts of opportunities to dip in. The trick is to teach yourself to read in small sips as well as in long swallows. Waiting rooms were made for books -- of course! But so are theater lobbies before the show, long and boring checkout lines, and everyone's favorite, the john. You can even read while you're driving, thanks to the audiobook revolution. Of the books I read each year, anywhere from six to a dozen are on tape. As for all the wonderful radio you will be missing, come on -- how many times can you listen to Deep Purple sing "Highway Star"? Reading at meals is considered rude in polite society, but if you expect to succeed as a writer, rudeness should be the second-to-least of your concerns. The least of all should be polite society and what it expects. If you intend to write as truthfully as you can, your days as a member of polite society are numbered, anyway. Where else can you read? There's always the treadmill, or whatever you use down at the local health club to get aerobic. I try to spend an hour doing that every day, and I think I'd go mad without a good novel to keep me company. Most exercise facilities (at home as well as outside it) are now equipped with TVs, but TV -- while working out or anywhere else -- really is about the last thing an aspiring writer needs. If you feel you must have the news analyst blowhards on CNN while you exercise, or the stock market blowhards on MSNBC, or the sports blowhards on ESPN, it's time for you to question how serious you really are about becoming a writer. You must be prepared to do some serious turning inward toward the life of the imagination, and that means, I'm afraid, that Geraldo, Keith Obermann, and Jay Leno must go. Reading takes time, and the glass teat takes too much of it. Once weaned from the ephemeral craving for TV, most people will find they enjoy the time they spend reading. I'd like to suggest that turning off that endlessly quacking box is apt to improve the quality of your life as well as the quality of your writing. And how much of a sacrifice are we talking about here? How many Frasier and ER reruns does it take to make one American life complete? How many Richard Simmons infomercials? How many whiteboy/fatboy Beltway insiders on CNN? Oh man, don't get me started. Jerry-Springer-Dr.- Dre-Judge-Judy-Jerry-Falwell-Donny-and-Marie, I rest my case. Seven months later I suggested to my wife that it was time to discontinue the sax lessons, if Owen concurred. Owen did, and with palpable relief -- he hadn't wanted to say it himself, especially not after asking for the sax in the first place, but seven months had been long enough for him to realize that, while he might love Clarence Clemons's big sound, the saxophone was simply not for him -- God had not given him that particular talent. I knew, not because Owen stopped practicing, but because he was practicing only during the periods Mr. Bowie had set for him: half an hour after school four days a week, plus an hour on the weekends. Owen mastered the scales and the notes -- nothing wrong with his memory, his lungs, or his eye-hand coordination -- but we never heard him taking off, surprising himself with something new, blissing himself out. And as soon as his practice time was over, it was back into the case with the horn, and there it stayed until the next lesson or practice-time. What this suggested to me was that when it came to the sax and my son, there was never going to be any real play-time; it was all going to be rehearsal. That's no good. If there's no joy in it, it's just no good. It's best to go on to some other area, where the deposits of talent may be richer and the fun quotient higher. Talent renders the whole idea of rehearsal meaningless; when you find something at which you are talented, you do it (whatever it is) until your fingers bleed or your eyes are ready to fall out of your head. Even when no one is listening (or reading, or watching), every outing is a bravura performance, because you as the creator are happy. Perhaps even ecstatic. That goes for reading and writing as well as for playing a musical instrument, hitting a baseball, or running the four-forty. The sort of strenuous reading and writing program I advocate -- four to six hours a day, every day -- will not seem strenuous if you really enjoy doing these things and have an aptitude for them; in fact, you may be following such a program already. If you feel you need permission to do all the reading and writing your little heart desires, however, consider it hereby granted by yours truly. The real importance of reading is that it creates an ease and intimacy with the process of writing; one comes to the country of the writer with one's papers and identification pretty much in order. Constant reading will pull you into a place (a mind-set, if you like the phrase) where you can write eagerly and without self-consciousness. It also offers you a constantly growing knowledge of what has been done and what hasn't, what is trite and what is fresh, what works and what just lies there dying (or dead) on the page. The more you read, the less apt you are to make a fool of yourself with your pen or word processor. 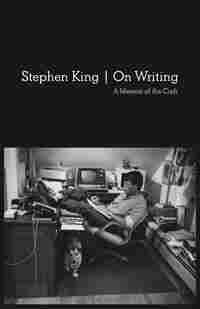 Excerpted from On Writing by Stephen King. Copyright 2010 by Stephen King. Reprinted by permission of Scribner Press.